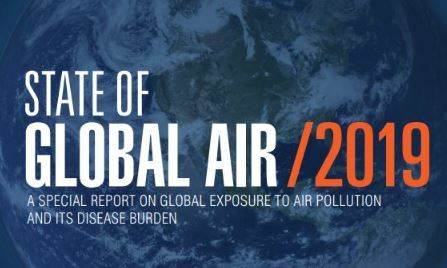 United States-based institutes Health Effects Institute (HEI) and Institute for Health Metrics and Evaluation (IHME) released a detailed report on the quality of the global air with title, “State of Global Air-2019”. The State of Global Air-2019 indicates that India and China are collectively accounted for more than fifty percent of global 5 million deaths due to air pollution. The State of Global Air 2019 report also said that in 2017, exposure to PM 2.5 pollution was found to be the third leading risk factor globally for Type 2 diabetes. According to the State of Global Air 2019 report, over 1.2 million people died in India due to air pollution in 2017. Nearly 5 million deaths from stroke, diabetes, heart attack, lung cancer, and chronic lung disease in 2017 happened due to the overall long-term exposure to outdoor and indoor air pollution. Out of these 5 million deaths, 3 million deaths are directly attributed to PM2.5, half of which is from India and China together. Air pollution is the third highest cause of death among all health risks in India, and the life of a South Asian child born today will be shortened by two years and six months growing up in current high levels of air pollution, while the global life expectancy loss is 20 months. US-based organization Health Effects Institute (HEI) released this report. Some schemes like the Pradhan Mantri Ujjwala Yojana, Household LPG program, accelerated Bharat Stage 6/VI clean vehicle standards, and the new National Clean Air Programme were initiated by the Indian government to minimize the air pollution.